Local children provided design input for this popular City Forest. Aquatic play parks or Splashpads have become one of the most sought after park activities by park directors over the past several years. Aquatics International recently unveiled their annual Dream Designs issue highlighting 10 of the best aquatic facilities for 2015 and this year three stand-alone Splashpads were recognized. Even though the 10 facilities are dispersed around the world, they all share a crucial bond, which is a sense of mission. This mission is rooted in the recognition that water adds dimension to life, and to bring that magic to as many people as possible. Each award winner was designed to bring people together for an engaging, exciting and safe water play experience. 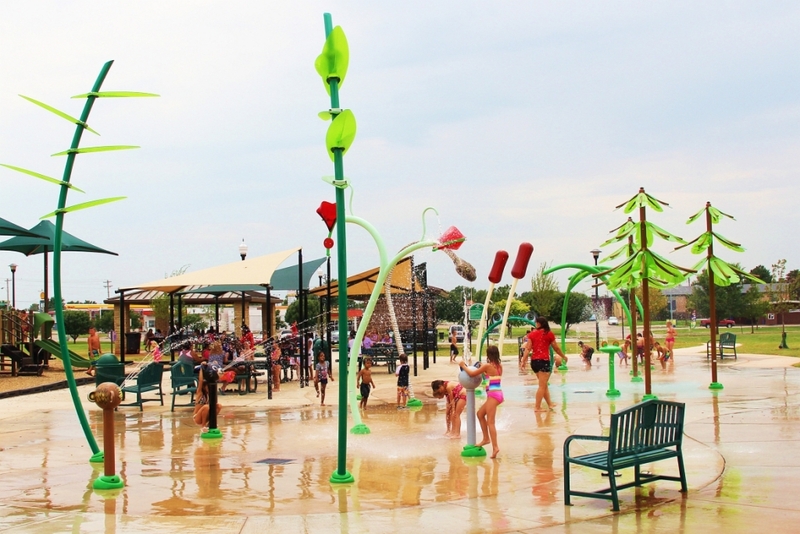 This year our very own Splashpad, Parmele Park, in Moore, Oklahoma was selected as a 2015 Dream Design Award Winner. The unique aspect behind this Splashpad is that it had design input from its biggest customers, the local elementary school children who chose a Forest Theme. Looking to improve the park facilities in the community, the City of Moore Parks and Recreation Department chose Parmele Park for their first Splashpad. The City chose a Splashpad that would benefit children by incorporating stimulating, challenging, collaborative and cross-generational play elements. Once the theme was chosen, Power Play began designing an interactive, refreshing, and entertaining space filled with whimsical, giant water leaves and trees, colorful misting cattails and various animal motifs. Integral colored concrete created a playful and fun design for the kids to enjoy while reinforcing the Forest Theme. Tan colored concrete was used to resemble the forest while a dark brown provided a walking path through the forest leading to a blue pond. The Splashpad includes 20 above ground features and 15 ground spray features. It was designed with distinct activity bays that stimulate and challenge children of all ages and abilities. The “Family Bay” is at the center of the 4,500 sq. ft. Splashpad and features a bullfrog spray loop, a frog and a custom rattlesnake that shoots stream of water. Infants and preschoolers are introduced to larger water elements with interactive features that allow touching, rotating and moving. The “Action Bay” is high energy group play area geared towards teen and tweens. In addition to promoting social development skills, the “Action Bay” is designed around play products that initiate high intensive activities and collaborative play. This area features interactive wolf, mountain lion and bear water cannons, several cause-and-effect ground sprays and the always popular dumping flowers. Inviting to infants and toddlers, the “Toddler Bay” encourages little ones to engage in cognitive development, censorial discovery, motor skills development and socialization through interaction. Custom mushrooms are the perfect height for little ones to support themselves while enjoying the fun of laminar streams of water and gentle streaming jets. These unique mushrooms along with the Aqua Dome, Jet Streams and Spider Spray provide non-intimidating water effects and fun for the toddlers. Cost saving and water conservation strategies include reduced-consumption nozzles and spray heads, two touch bollard activators, which allow the community to save water and money since water features operate only when a child touches the activator during operational hours pre-set by the city and programmed spray sequences that operate water features at different times and locations to generate interest and interactivity within the Splashpad bays. The stainless steel spray elements are recyclable at the end of life, plastics are recyclable and brass spray heads and nozzles are lead-free. The City has chosen to be environmentally friendly by irrigating the park from a water feature that traverses the entire length of the Splashpad. To enhance guests’ experiences, a concrete plaza area was included in the design to connect the Splashpad and playground so children can move freely from one to the other. The plaza includes several seating areas under shade structures and essential site furnishings such as ADA picnic tables, park benches and trash receptacles. After another devastating tornado touched down in Moore in 2012, the new Splashpad was the perfect addition for a resilient community going through a re-building process.